University of Alabama Press Archives - Joelle Delbourgo Associates, Inc. The complex friendship between a black housekeeper and her Jewish employer is at the heart of Hoffman’s prize-winning novel about life in the civil rights era South–now in a 35th Anniversary Edition! Nebraska Waters is black. Vivian Gold is Jewish. In an Alabama kitchen where, for nearly thirty years, they share cups of coffee, fret over their children, and watch the civil rights movement unfold out their window, and into their homes, they are like family—almost. As Nebraska makes her way, day in and out, to Vivian’s house to cook and help tend the Gold children, the “almost” threatens to widen into a great divide. The two women’s husbands affect their relationship, as do their children, Viv Waters and Benjamin Gold, born the same year and coming of age in a changing South. The bond between the women both strengthens and frays. Roy Hoffman’s Almost Family (University of Alabama Press) explores the relationship that begins when one person goes to work for another, and their friendship—across lines of race, income, and religion—develops degrees of understanding yet growing misunderstanding. This edition (2018) commemorates the 35th anniversary of the book’s publication and features a foreword by the author and includes a discussion guide for readers and book clubs. Roy Hoffman is the author of the novels Come Landfall and Chicken Dreaming Corn and the nonfiction books Back Home: Journeys through Mobile and Alabama Afternoons: Profiles and Conversations. His essays have appeared in the New York Times, Wall Street Journal, and Washington Post, and he was a long-time staff writer for the Mobile Press-Register. He received the Clarence Cason Award in nonfiction from The University of Alabama and is on the faculty of Spalding University’s low-residency MFA in Writing Program. Set along the Mississippi Gulf Coast, the stories of three women and the men they love come together in this novel of war and h urricanes, loss and renewal. The worlds of three women and the men they love come together in this novel of war and hurricanes, loss and renewal. Christiane, or Nana, reliving the past in her eighties, her granddaughter Angela, working at a Biloxi casino in her twenties, and their teenage friend Cam, the daughter of a Vietnamese shrimper, form a deep connection. As they face heartbreak, their bonds nurture and sustain them. Ordinary people impacted by the shifts of history—Come Landfall is a southern story with a global sensibility. The Gulf Coast serves as more than just a setting—it is a character unto itself. With casinos lining one side of the highway, antebellum homes along the other, and a Vietnamese neighborhood up the road, here the old South collides with the new. From households along this stretch of US 90, lineages and emotional connections stretch all over the world. Inspired by true events, Roy Hoffman’s novel has its seeds in the saga of his uncle, Maj. Roy Robinton, US Marine Corps, a WWII prisoner of war in the Philippines who disappeared as captive on a Japanese “hellship.” His young bride, back home, was ground down, waiting. Christiane returns in her mind to the man she married at twenty-one—Rosey, a flyer with the Army Air Corps who was in the Philippines at the outbreak of WWII. Angela meets Frank, an airman at Keesler Air Force base who is proudly patriotic, deeply religious, and a student of weather. Cam falls in love with Joe, a Biloxi cop, and her own tumultuous story begins to interweave with that of Angela’s and Nana’s. 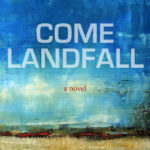 What’s taken from Nana, Angela, and Cam (and so many others when storms make their landfall), what’s given back, and what’s kept forever sit at the heart of this intimate yet expansive novel. is author of the novels Almost Family, winner of the Lillian Smith Award, and Chicken Dreaming Corn, endorsed by Harper Lee. He is the author of two essay collections, Back Home: Journeys Through Mobile and Alabama Afternoons: Profiles and Conversations. His articles have appeared in the New York Times, Fortune, Southern Living, and the Mobile Press-Register, where he was a long-time staff writer. A graduate of Tulane, he received the 2008 Clarence Cason Award from the University of Alabama’s College of Communication and Information Sciences. He teaches for Spalding University’s brief-residency MFA in Writing Program.